Ranger on‐site training is now included FREE OF CHARGE for all domestic customers who purchase a new Ranger CRT380R Wireless Wheel Alignment System from an authorized Ranger Products dealer. Training includes in-person assistance for initial set-up, detailed instruction in the proper operation of the unit and the application of your new Ranger CRT380R Wireless Alignment System to real-world shop situations. Ranger on-site sessions are tailored to train both the novice and the advanced wheel alignment technician in general aligner implementation. Now you can employ the latest wheel alignment technology in your shop, so both you and your clients can enjoy the ease, speed and accuracy of advanced Ranger wheel alignment. Students are instructed on the fundamental two- and four-wheel alignment principles, proper equipment operation and common OEM adjustment methods found on both domestic and imported passenger cars and light trucks. They will also learn how to correctly use the CRT380R Wheel Aligner to measure primary alignment angles, in addition to wheel alignment-related pulls, tire wear and crooked steering wheels. On‐site factory techs ensure that you've received your complete CRT380R shipment and that it is set up correctly. Train everyone at once—multiple users are welcome to attend the CRT380R training. 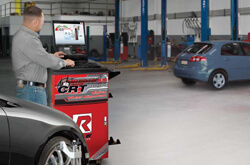 Your wheel alignment technicians will learn how to set up and use the CRT380R software and install updates. Technicians learn best by doing, not by reading manuals. Experience the CRT380R's full capabilities in a live shop environment. Get real-time answers to all of your wheel alignment questions from a trained Ranger expert who is physically on location. The trainer leads you through the ins and outs of the program software and addresses any questions regarding implementation and use. We come to you. You don't even have to take off work and make travel arrangements to attend this seminar. On‐site training is the most effective option because the Ranger expert works with your people, on your equipment, in your shop. There is no better real-world environment than the real world! Since the on-site training is set up especially for you, the session will focus on the areas of wheel alignment training that you care about. While our experts certainly come prepared with an all-inclusive lesson plan, they do not operate on a "one size fits all" teaching mentality. They will cater to your specific needs and no one else's. The CRT380R weekday session typically starts at 9:00 AM and ends at 4:00 PM. Training is offered over a single‐day period.